Kyulux, Inc., a world leader in next generation organic light emitting diode (OLED) technology, and WiseChip, a leading manufacturer of organic light emitting diode (OLED) products, today announced that the two companies plan to release a commercial product utilizing 4th generation HyperfluorescenceTM OLED light emission technology. This will be the first commercial product using this new generation of organic compounds in a commercial display product. HyperfluorescenceTM is a 4th generation OLED technology that outperforms all previous generations of OLED emitters. The first generation of fluorescent compounds used for blue pixels in today’s cell phones and televisions are only 25% efficient and thus reduce the energy efficiency or battery life. The second generation green and red emitters used in cell phones and televisions are 100% efficient, but they use an expensive rare metal Iridium. This second generation of materials also suffers from an inferior color purity compared to the first generation. Fourth generation HyperfluorescenceTM allows for 100% quantum efficiency in a completely organic molecule without requiring the use of rare heavy metals to attain 100% efficiency. Further, HyperfluorescenceTM technology combines the superior color purity of gen 1 materials and the efficiency of gen 2 materials, allowing for increased battery life or increased brightness without sacrificing color purity. WiseChip plans to begin offering commercial display products incorporating HyperfluorescenceTM by Q4 2017 and will become the first OLED display manufacturer to offer these 4th generation OLED displays for PMOLED applications. 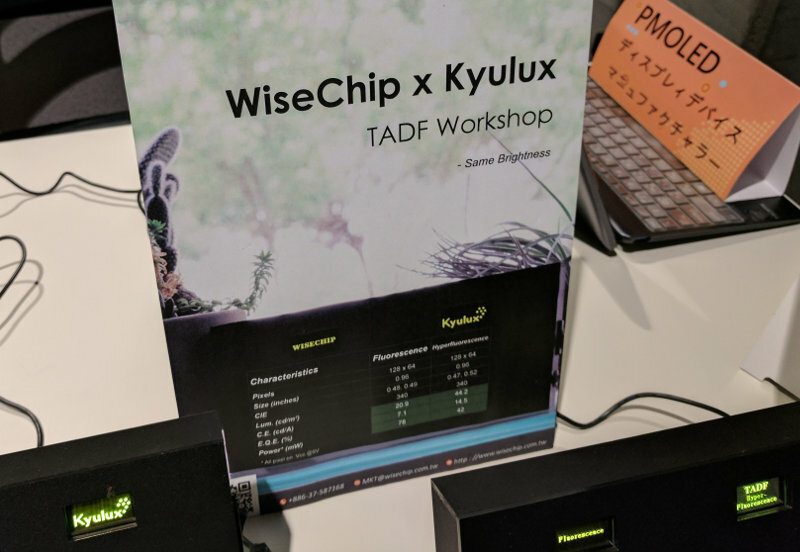 Through a highly collaborative engineering partnership, WiseChip and Kyulux have been able to rapidly increase the lifetime of TADF and HyperfluorescenceTM OLED devices even at the high current densities required for PMOLED applications. WiseChip and Kyulux will initially offer 4th generation monochromatic yellow and green displays, with red, blue and white displays planned for commercial launch in the near future.